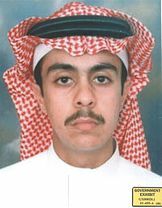 Saeed Abdallah Ali Sulayman al-Ghamdi (Arabic: سعيد الغامدي‎, Sa'īd al-Ghāmdī) (November 21, 1979 – September 11, 2001) was one of four hijackers of United Airlines Flight 93 as part of the September 11 attacks. Born in Saudi Arabia, Ghamdi left his home to fight in Chechnya after dropping out of college, but was reported to have diverted to Afghanistan to train in an al-Qaeda camp. It was reported he was chosen by Osama bin Laden to participate in terrorist attacks in the United States and arrived in the U.S. in June 2001. During his stay in the U.S., he quietly settled in Florida, planning out how the attacks would commence and training on flight simulators. On September 11, 2001, it was reported he boarded United 93 and assisted in the hijacking of the plane, which was crashed into a field in the control of hijacker-pilot Ziad Jarrah in Shanksville, Pennsylvania, after the passengers attempted to retake control of the plane in an uprising. Ghamdi was from the al Bahah province of Saudi Arabia, and shared the same tribal affiliation with fellow hijackers Ahmed al-Ghamdi, Hamza al-Ghamdi, and Ahmed al-Haznawi, although he was not related to either Ghamdi. He may have been in contact with the two Ghamdis and Haznawi as early as 1999. This group is noted as being some of the more religiously observant of the hijackers. Ghamdi spent time in al Qasim province, Saudi Arabia where he transferred to college but soon dropped out and ceased contact with his family. While there he probably associated with the radical Saudi cleric named Sulayman al-Alwan as several other future hijackers had. Saeed later headed to Chechnya to participate in the conflict against the Russians. At this time, Chechen fighters were turning away additional foreigners, many of whom ended up in al-Qaeda camps in Afghanistan to train and await entry to Chechnya. Saeed ended up at the Al Farouq training camp, where he met Ahmed al-Nami, and the brothers Wail and Waleed al-Shehri. The four reportedly pledge themselves to Jihad in the Spring of 2000, in a ceremony presided over by Wail—who had dubbed himself Abu Mossaeb al-Janubi after one of Muhammad's companions. Saeed was known to Tawfiq bin Attash who is thought to have convinced him to become a martyr. Saeed was at that time working as a security guard at Kandahar airport along with Waleed al-Shehri. Some time late in 2000, Saeed traveled to the United Arab Emirates, where he purchased traveler's cheques presumed to have been paid for by Mustafa al-Hawsawi. Five other hijackers also passed through the UAE and purchased travellers cheques, including Majed Moqed, Wail al-Shehri, Hamza al-Ghamdi, Ahmed al-Haznawi and Ahmed al-Nami. On November 13, 2000, another Saeed al-Ghamdi tried to obtain a visa to enter the United States, but was declined. Although the 9/11 Commission makes mention of him, there is no evidence he was associated with the hijackers. In March 2001, Saeed was filmed in a farewell video that was later aired on al-Jazeera. In the video, many future 9/11 hijackers swear to become martyrs, although no details of the plot are revealed. Saeed referred to America as "the enemy", and is seen studying maps and flight manuals. On June 12, 2001, Saeed al-Ghamdi applied for and received a second two-year US B-1/B-2 (tourist/business) visa in Jeddah, Saudi Arabia. His application was submitted by a local travel agency and processed through Visa Express, a controversial US visa program in Saudi Arabia which was discontinued the following year. Arriving in the U.S. on June 27, 2001, with Fayez Banihammad, Saeed shared an apartment with Ahmed al-Nami in Delray Beach, Florida. Oddly, he listed the Naval Air Station in Pensacola, Florida, as his permanent address on his driver's license. He was one of 9 hijackers to open a SunTrust bank account with a cash deposit around June 2001. —  Saeed al-Ghamdi, August 2001. On September 7, all four of Flight 93 hijackers flew from Fort Lauderdale to Newark International Airport aboard Spirit Airlines. On the morning of September 11, 2001, Ghamdi boarded United Airlines Flight 93 without incident. Due to the flight's delay, the pilot and crew were notified of the previous hijackings that day, and were told to be on the alert. Within minutes, Flight 93 was hijacked as well. At least two of the cell phone calls made by passengers indicate that all the hijackers they saw were wearing red bandanas. The calls also indicated that one of the men had tied a box around his torso, and claimed there was a bomb inside; it is not known which hijacker this was. According to the cockpit transcript released later, it appeared Saeed may have been at the controls of the flight when it crashed, although the 9/11 commission asserts that Ziad Jarrah was the pilot. Passengers on the plane heard through phone calls the fates of the other hijacked planes. A passenger uprising resulted in the plane crashing into a field in Shanksville, Pennsylvania, killing everyone aboard. On September 23, 2001, before the FBI had released the pictures of the hijackers, the BBC and The Daily Telegraph reported that a Saudi Airlines pilot named Saeed al-Ghamdi was furious that a name on the hijacker's list released by the FBI matched his own. CNN also showed a picture of the "living" Ghamdi as the hijacker. The man claimed CNN likely got his picture from a Flight Safety flying school in Florida he attended. Der Spiegel later investigated the claims of "living" hijackers by the BBC and discovered them to be cases of mistaken identity. In June 2005 the Saudi government released a list (see al-Qaeda in the Arabian Peninsula) of 36 wanted (and alive) terrorists, one of whom was Salih Sa'id Al Batih al-Ghamdi. 9/11 conspiracy theorists quickly confused him with the hijacker Saeed al-Ghamdi. He has been portrayed by Iraqi actor Lewis Alsamari in United 93 and Shawn Ahmed in Flight 93. ^ This was said to be a reference to two military/governmental targets and two civilian, nineteen hijackers, four planes. ^ MacKinnon, Colin (3 October 2006). Morning Spy, Evening Spy: A Novel. New York City: St. Martin's Press. ISBN 978-1-4299-9357-9. ^ a b The 9/11 Commission Report (PDF) (Report). Washington DC: United States Government Printing Office. July 22, 2004. p. 231-33. Archived from the original (PDF) on August 9, 2010. ^ Sennott, Charles M. (March 3, 2002). "Before oath to jihad, drifting and boredom". Boston Globe. Boston, Massachusetts: Boston Globe Partners L.P. Archived from the original on October 10, 2008. ^ "Al-Jazeera offers accounts of 9/11 planning". Cable News Network. Time Warner. September 12, 2002. Archived from the original on February 20, 2006. Retrieved February 20, 2006. ^ "Hijack 'suspects' alive and well". BBC News. BBC. 23 September 2001. Archived from the original on 2018-12-06. Retrieved 7 December 2018. ^ Harrison, David (23 September 2001). "Revealed: the men with stolen identities". The Daily Telegraph. Archived from the original on 2003-01-19. Retrieved 7 December 2018. ^ "Panoply of the Absurd". Spiegel Online. September 8, 2003. Archived from the original on 2012-05-24. Retrieved 7 December 2018. ^ al Kinani, Majid; Al-Zaydi, Mshari (29 June 2005). "Saudi Arabia issues New list of wanted "terrorist" suspects, Asharq Al-Awsat Exclusive: Al Qaedas in Saudi Arabias new leader is a Moroccan National". Asharq Al-Awsat. Archived from the original on 6 July 2005. Retrieved 7 December 2018. This page was last edited on 21 March 2019, at 11:53 (UTC).